TORONTO — For six years, Dan Skilleter worked as a policy adviser in Ontario’s provincial government. But this year, he gave up his much-coveted government job for a new role in an uncertain, fast-moving industry: cannabis. He joined Lobo Genetics, a Toronto-based start-up that tests genetic markers in a person’s saliva to predict how that person’s body will react to marijuana, as its director of policy and communications. Skilleter is not alone. As Canada became the second country in the world to legalize recreational marijuana use on Oct. 17, its nascent cannabis and cannabis-adjacent industries have poached top talent from more traditional sectors of the economy. 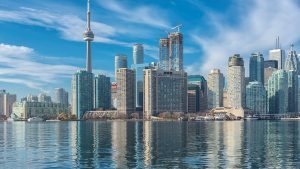 Analysts say the growing number of jobs in the space, the chance to join firms with sky-high valuations and the opportunity to shape a burgeoning industry where Canada has leapfrogged the United States and could become a world leader are fueling this migration. According to Statistics Canada, there were nearly 2,400 people employed by 55 licensed marijuana producers at the end of 2017. Medical cannabis has been legal since 2001, but with the end of a 95-year prohibition on the recreational use of the drug, the number of job vacancies in the multibillion-dollar industry has exploded. A report from the job-posting site Indeed.ca found that in July 2017 the number of cannabis-related jobs on its site tripled and that searches for the terms “cannabis” and “marijuana” more than quadrupled, compared with the same point the year before. Jobs in the sector run the gamut from budtender to quality assurance specialist to cannabis connoisseur. The jobs boom has transformed a number of small Canadian cities, such as Smith Falls, Ontario, which is home to the headquarters of cannabis juggernaut Canopy Growth Corp., the first Canadian marijuana firm to list on the New York Stock Exchange (ticker symbol: WEED). Valued at $10 billion, Canopy Growth has created nearly 800 jobs in the city of 9,000 people since it set up shop five years ago in a facility previously occupied by chocolate maker Hershey. Most of the initial jobs in the industry were production and cultivation roles, she said, but more recently, McMahon has noticed an uptick in firms looking to hire people with marketing and sales experience as retail shops have opened. Because the industry does not have a true analog, filling some positions — particularly on the cultivation side — has been difficult. “It’s not as easy as switching from growing tomatoes to growing cannabis,” said Marc Wayne, managing director of Canopy Health Innovations, a subsidiary of Canopy Growth. A number of Canadian postsecondary institutions are beginning cannabis-related degree and training programs to help fill this gap. In cities like Toronto, where the technology sector is white-hot, marijuana firms are also fighting tooth-and-nail with start-ups for the best data scientists and engineers. “We’re all competing for the same talent pool,” said David Berg, president and chief technology officer of Strainprint Technologies, which offers an app to medical cannabis users that allows them to track their physical and mental reactions to different strains and doses of the drug. Some of that stigma has dissipated with legalization, he added, noting that his team of 27 people is projected to nearly double within the next calendar year. Fears that legally employed Canadians in the marijuana industry would face lifetime bans from the United States have also been mostly assuaged, after U.S. Customs and Border Protection updated its policy on cannabis and the border last week to allow Canadian cannabis workers entry to the United States as long as their reason for travel is not related to the cannabis industry. Skilleter said the border issue crossed his mind when he was deciding whether to join Lobo Genetics. “Ultimately, I was working under the premise that calmer heads and common sense would prevail,” he said.